The oil of certain fish contains an essential fatty acid known as omega-3. Omega-3 fatty acids are necessary for human health and development, but they cannot be produced by the body. Fish oil may help treat a number of medical conditions and may influence female hormones; however, the effect of fish oil on female hormones is not well understood. Consult your physician before taking a fish oil supplement. Omega-3 fatty acids are found in oily fish like salmon or tuna. Because omega-3 fatty acids are crucial to many functions, some people opt to take fish oil supplements if they do not have much seafood in their diet. Although omega-3 fatty acids are linked to a number of potential health benefits, the evidence is strongest for their role in cardiovascular health, according to the University of Maryland Medical Center. Other potential benefits include lowering markers of diabetes, reducing the risk of certain cancers, improving mood and reducing inflammation. Omega-3 fatty acids in fish oil contain lignans. Lignans are compounds with a weak estrogenic effect and are present in foods like soybeans and flaxseeds. According to BreastCancer.org, lignans can trick the body into thinking they are estrogen and can bind to estrogen receptors, taking the place of stronger estrogen cells. This may be important in diseases like breast cancer that may be linked to an excess in estrogen. More research is needed to understand whether fish oil can reduce estrogen levels in women. An article published in "Obstetrical and Gynecological Survey" in 2004 discussed the association between fish oil and female hormones. Omega-3 fatty acids are precursors to locally produced hormones called eicosanoids. These hormones are important in helping to prevent and treat various diseases, such as breast cancer, postmenopausal osteoporosis, menstrual problems and postpartum depression. Omega-3 fatty acids also increase certain female hormones related to fertility. They may be important during pregnancy in helping with the growth and development of the baby. Speak to your medical provider before taking a fish oil supplement. Fish oil can interact with medications such as blood thinners, insulin, steroids and non-steroidal anti-inflammatory drugs. High doses of fish oil can cause bleeding, although this is very rare. People with schizophrenia or diabetes should take fish oil only under the care of a physician because they may not be able to convert fish oil into the type of acids used by the body. 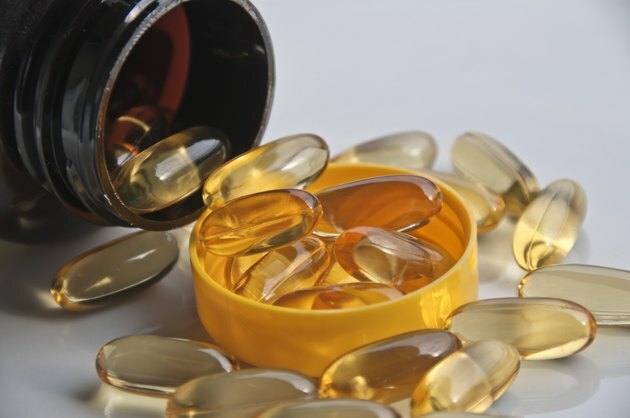 Side effects of fish oil supplements are usually mild and include gas, belching and diarrhea.